This enables the automaker to build quieter cars by deleting air leaks, resulting in diminished wind noise, a key element in customer satisfaction. By creating a color-coded image of the heat signatures within a view, thermal imaging is used in numerous ways. In 2009, it was even used to screen for victims of Swine Flu by governmental agencies at airports. Ford uses thermal imaging to show where air leaks in the vehicle design are – they show up as hot spikes revealing the escape of heated air. "Ford is redefining our vehicles through many innovations – both features to improve the driving experience and fuel economy, and advanced new tools to help engineer better vehicles," said William Dedecker, noise, vibration and harshness engineering supervisor. "We are using thermal imaging to further improve quietness so customers can enjoy the other features our vehicles offer, such as audio systems...and even the sounds of silence." Taking inspiration from energy companies, who use thermography to identify energy leaks in homes, Ford uses the technology to locate the leaks in their prototypes. The air inside the car is heated, and thermal imaging shows specifically where the air leaks out of the cabin. The result is the development of ways to contain the air, using design and insulation changes. "We are the first automaker to use this technology to track air leaks," said John Crisi, Ford NVH engineer. "It's an example of the innovative methods we use so our customers have a more pleasant driving experience. Our cameras can detect tiny holes and openings we could not otherwise identify." Besides reducing noise, sealing leaks makes heating and cooling more efficient and to whatever extent power is produces by the engine, mileage is increased as well. Previously Ford used visual perception to find the small holes that allow air to leak. The cabin would be filled with smoke and technicians would watch for the whispers of smoke to emerge. They would also use tactile sensation to detect these leaks, walking around the vehicle feeling for airflows. With stethoscope like devices, they would try to hear air escaping the vehicle – remarkably this method is still used to some extent. Using thermal imaging hastens and refines the whole process. The areas most vulnerable to air leaks, and thus noise, are moonroofs, windows, door trim, trunk lids, liftgates, doors and windshields. "Wind noise is something a driver can really sense in a negative way while driving," Crisi explained. "By using thermal imaging technology, Ford can provide a smoother and quieter ride for our customers." 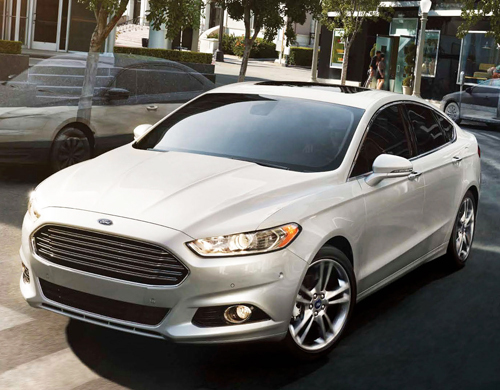 Ford has earned a 67 percent approval rating for interior quietness in the 2013 Ford Fusion, according to its US Global Quality Research System - the 2012 Toyota Camry scored only 58 percent. The data on the Fusion was based on the first quarter of 2013, though the full year of 2012 was used to arrive at the data on the Toyota Camry. Conducted for Ford by RDA Group of Bloomfield Hills MI, the 2013 first quarter study queried owners of various makes and models about their overall satisfaction regarding the first three months of ownership.